Grammy-winning country music artist Kathy Mattea makes a point during her guest lecture in late November. MTSU photo by Andy Heidt. College of Media and Entertainment student and aspiring country music artist Hunter Wolkonowski of Winchester, Tennessee, knew that singer-songwriter Kathy Mattea was coming to give a guest lecture in late November. But the real thing — which even included a few songs by the Grammy-winning country music artist — was still surreal. “I’ve been a fan of country music since I was a young girl, and I’d come in the house and I’d hear my Nana playing records on the record machine, and she’d play Kathy Mattea,” said Wolkonowski, who’s majoring in recording industry management. McCusker, a professionally trained ethnomusicologist and historian, said her MTSU Department of History course looks at how historical events have shaped music, such as producing certain kinds of “sounds” and/or musicians. Mattea’s visit stemmed from an interview she did with a graduate student last spring. McCusker assisted the student with the phone interview, which was done from MTSU’s Center for Popular Music in the Bragg Media and Entertainment Building, and an invitation was extended, which Mattea graciously accepted. Dr. Greg Reish, director of the Center for Popular Music, assisted McCusker with the logistics to bring Mattea to campus. Mattea shared with students how she got started in her music career and also discussed her social activism around issues such as HIV/AIDS and the environment. Mattea’s AIDS activism was sparked by friends who died from AIDS, but “nobody was talking about it,” McCusker said. A native of West Virginia coal country, Mattea would later turn her attention to the environment. 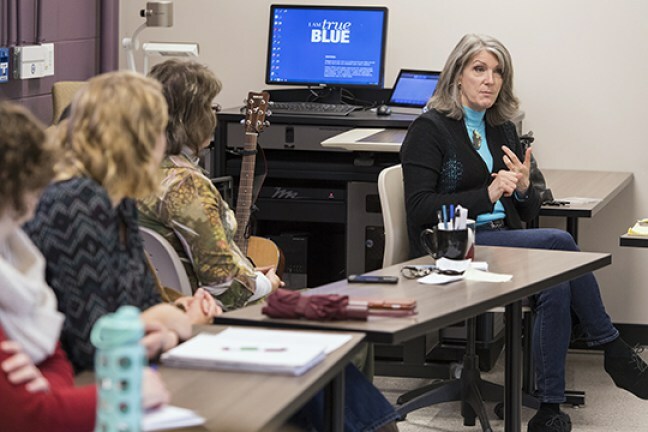 Grammy-winning country music artist Kathy Mattea, top right, lectures in MTSU professor Kris McCusker’s “American Music in the Modern Age” class. MTSU photo by Andy Heidt. 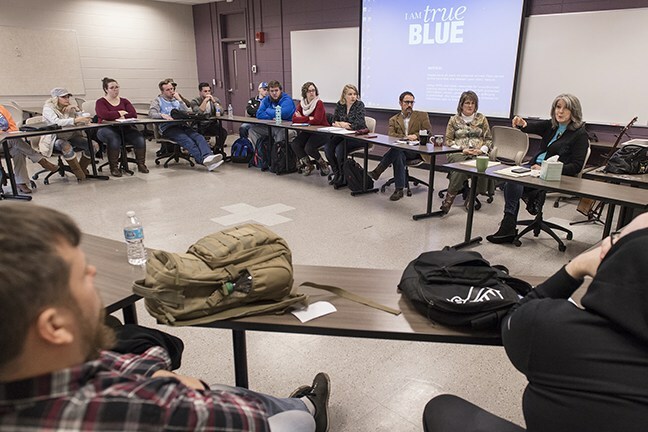 In the wake of a bitterly divisive presidential election, Mattea discussed with students “the beginnings of the ways she started seeing music differently, from simply being an entertainment medium, to a medium that builds relationships among people, that crosses political barriers around certain environmental and social issues,” McCusker said. Wolkonowski, who performs under the name “Hunter Girl“ a few times each week at various venues in Nashville, said she was inspired by Mattea’s socially conscious perspective. “I really liked how she had the ability to write songs that pertain to what’s going on in the world right now,” she said. For more information about the MTSU Department of History, visit www.mtsu.edu/history. For more information about the Center for Popular Music, visit www.mtsu.edu/popmusic.